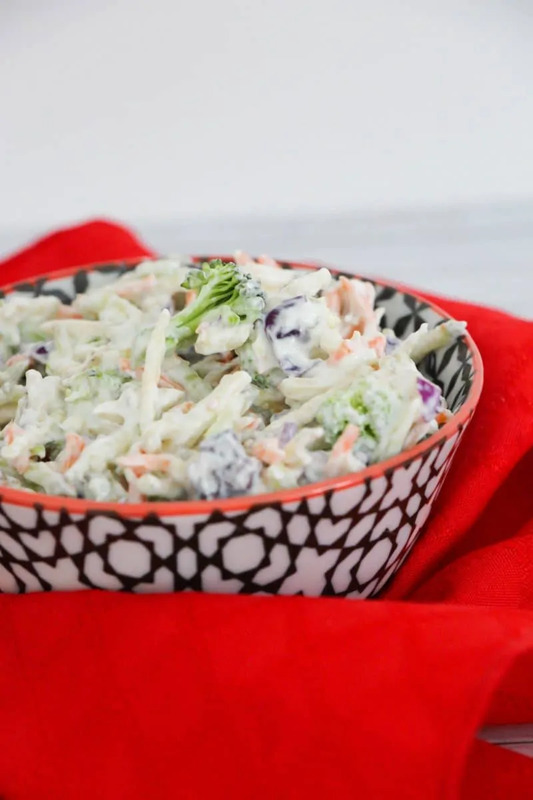 An easy, creamy no mayo coleslaw recipe made with greek yogurt, sour cream, apple cider vinegar, salt and pepper, and chopped veggies (or coleslaw mix). This guilt-free side dish recipe that makes an awesome healthy side dish for summer barbecues. What summer barbecue would be complete without big bowls of potato salad, pasta salad, and coleslaw? Coleslaw pairs so beautifully with barbecue. It’s also a great side dish for oven-fried chicken and many other dishes. But what if you’re trying to eat healthier? 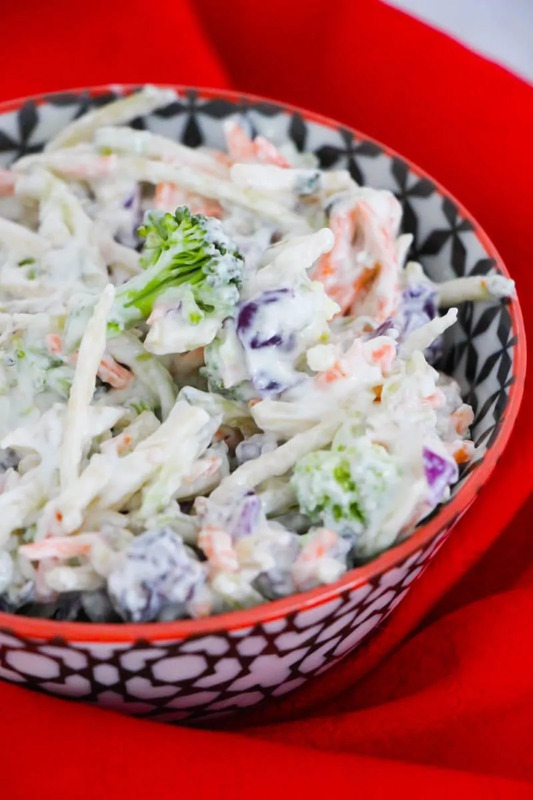 Can something as creamy and sweet as coleslaw be healthy? Sure. You just have to rethink coleslaw a bit. 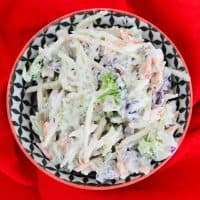 This no mayo coleslaw is just as creamy as typical coleslaw, thanks to Greek yogurt and sour cream, but the sugar has been omitted. 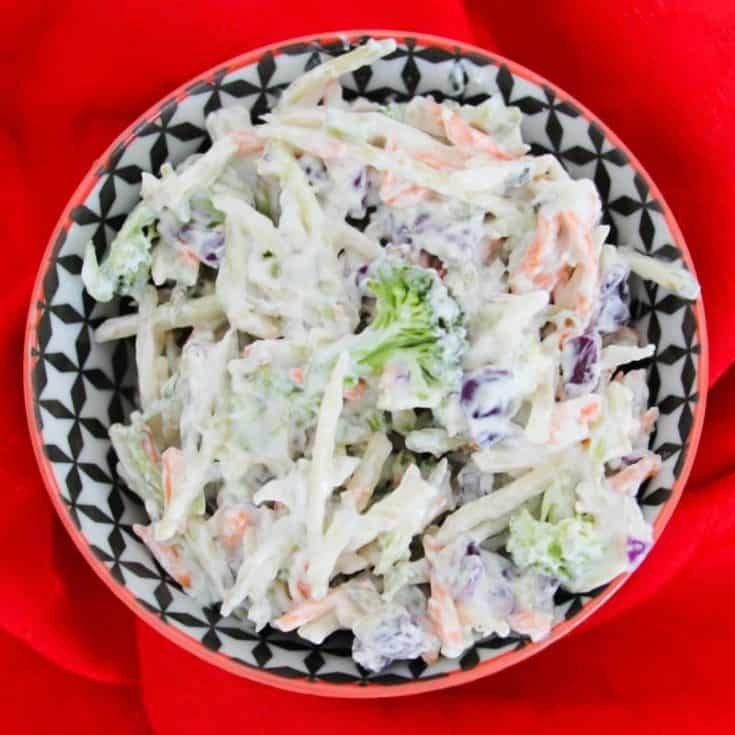 This gives you a coleslaw that is delicious on barbecue sandwiches or as a side dish. And the best part is, you won’t have to feel guilty about enjoying this coleslaw! Enjoy with a glass of delicious skinny peach lemonade for a guilt-free lunch. Start by gathering your ingredients. 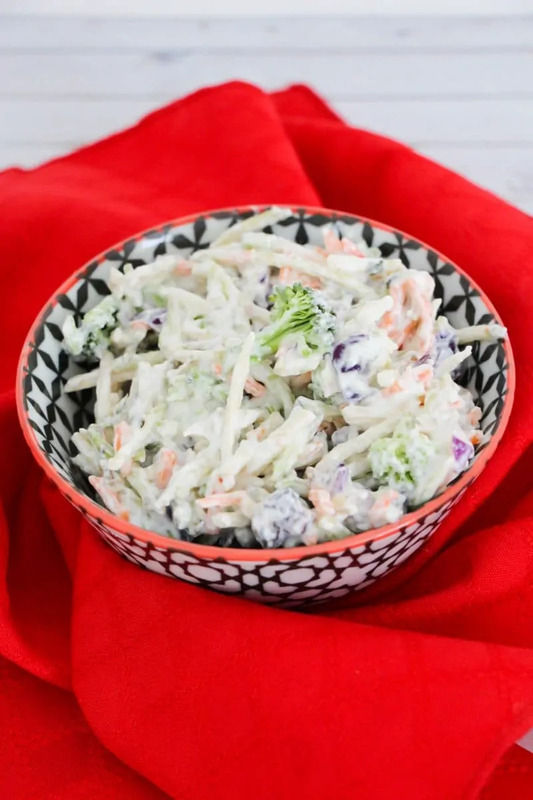 For this coleslaw recipe you will need plain greek yogurt, sour cream, apple cider vinegar, salt and pepper, and either a bag of coleslaw mix or cabbage, carrots, and broccoli if you would like to chop your own veggies and make your coleslaw from scratch. Lemon juice is optional, so if you would like to add a hint of lemon to your coleslaw grab some lemon juice as well. 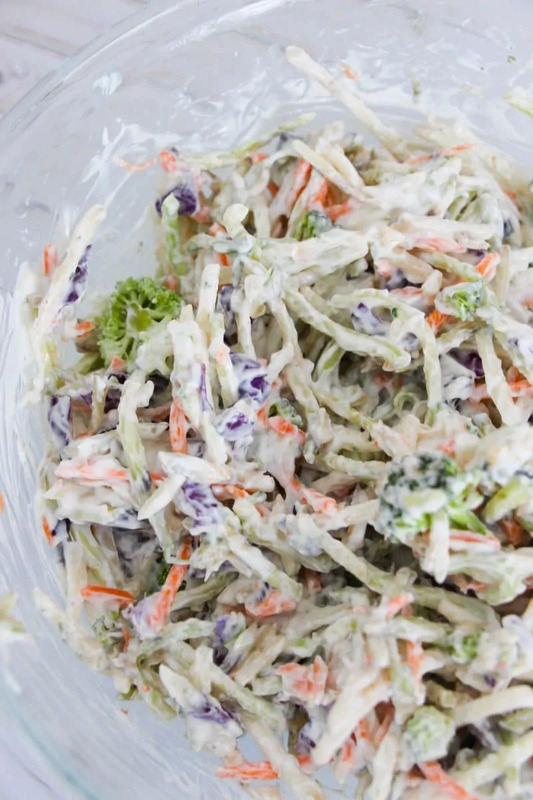 You won't believe how simple it is to put together this healthy coleslaw. Start by combining all your ingredients, except the veggie themselves, in a large bowl. Stir well to combine. Then, add your chopped veggies or premade coleslaw mix and toss to coat. Cover up your coleslaw and pop it in the refrigerator to chill until it is time to serve. If possible, allow to chill overnight to best allow all the flavors to combine. But no worries if you are making this as a last-minute side dish – it is fine to serve right away too. 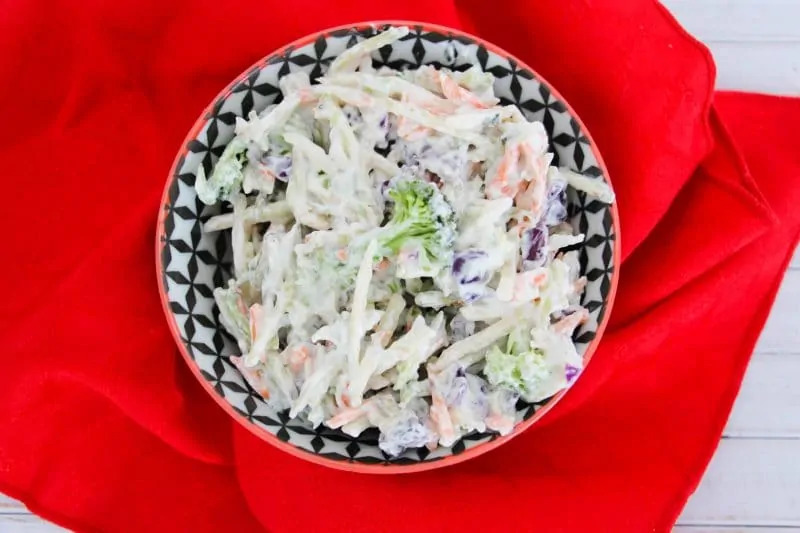 Your guests will love this light and creamy coleslaw recipe, and be impressed when you tell them that you made it without mayo! For an easy no-bake summer dessert, try this delicious berry trifle. 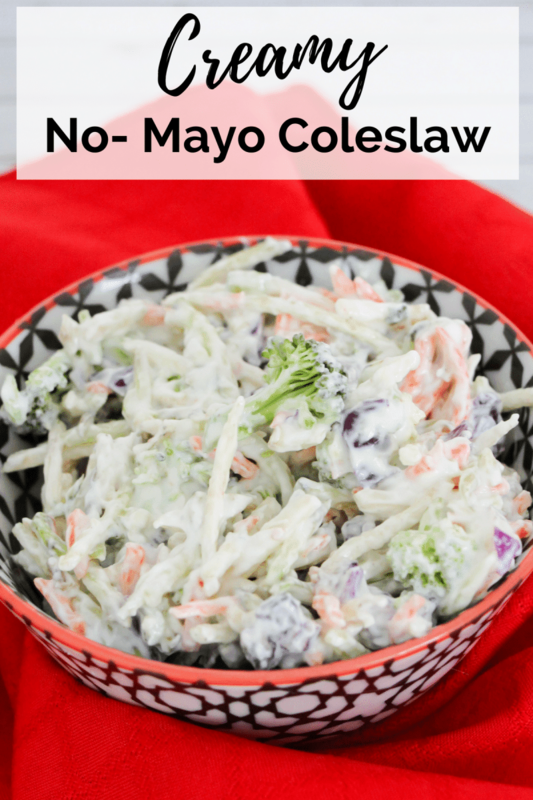 An easy, guilt-free, creamy no mayo coleslaw recipe that makes a perfect healthy side dish for summer barbecues. 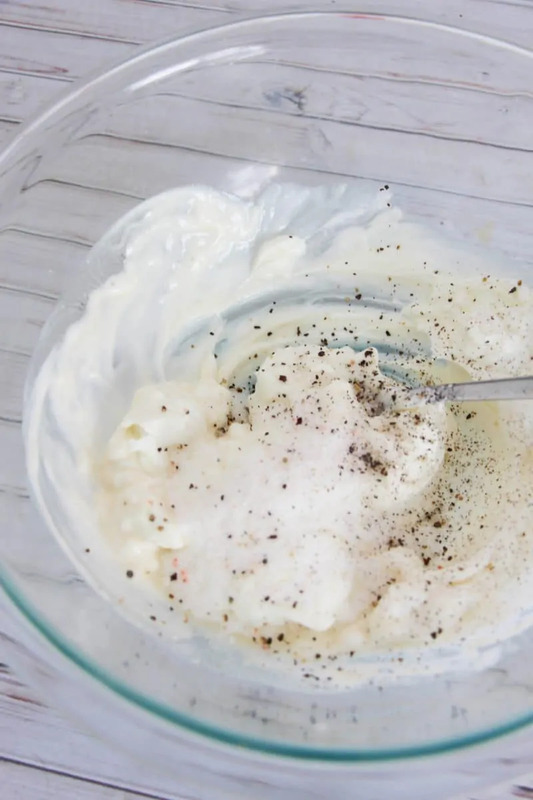 In a large bowl, combine greek yogurt, sour cream, apple cider vinegar, lemon juice, salt and pepper. Add coleslaw mix (or shredded vegetables) and toss to coat well. The flavor will get even better overnight, but you can serve immediately, if desired. This all sounds really really good. I love yogurt, so I bet it tastes yummy in this recipe. Gonna have to try it. I’d love to try this recipe. Thanks! Sounds like a good recipe! My favorite cole slaw is from Kentucky Fried Chicken. It certainly looks yummy! I’m sure it’s much more healthy with yogurt.